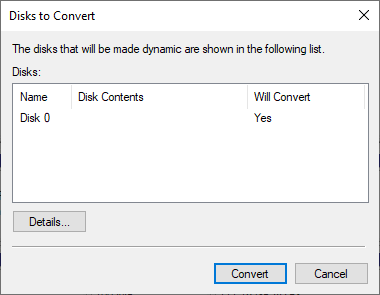 Home / How To / How to Convert Dynamic Disk to Basic? If you ever visited Disk Management on a Windows PC or tried to map a disk, change existing volumes, extend partitions or delete some, you’ve probably noticed that every disk marked as a “Basic” or “Dynamic”. Disk type defines the number of available features. This article explains the difference between dynamic and basic disc, and showing how to convert dynamic disc to basic (and vice-versa). Basic Disk vs Dynamic Disk – What’s the Difference? A basic disk is your best option if you are an ordinary Windows user. It fits your daily needs perfectly. This disk type works with primary partitions and logical drives, formatted accordingly to the needs of users (NTFS, for example). A user ends up with a formatted drive which is ready to store any type of data whether these are movies, music, games, apps or the operating system itself. USB drives or external HDDs/SSDs are also basic disks. A basic disk can be used for a Windows installation. It works with Master Boot Record and GUID Partition Table style for more modern computers with UEFI. 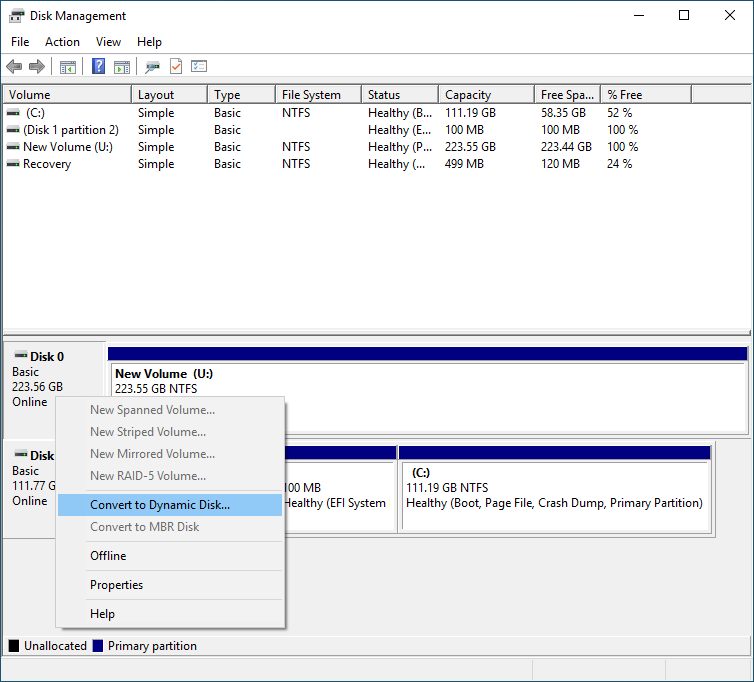 There is an option to extend or shrink partitions on a bask disk. This procedure gives you a way to change drive structure to fit your needs. You can also create logic drives, format drives and set them as an active. For an average consumer, the basic disk satisfies every need, thus there is no need to convert basic disk to dynamic disk (unless you need additional features that basic disk does not support). Here we move to the definition of the dynamic disk and will discuss what kind of benefits it provides. READ ALSO: How to Fix Error 0x8007045d on Windows 10? Dynamic disks give user additional features that can’t be accessed if your drive is basic. For examples, fault-tolerant volumes. These could be mirrored volumes or drives in the RAID5 configuration. You can use either MBR or GUID, depending on your system compatibility. Dynamic disks are very flexible and provide convenient management tools. Also, they have a special 1 MB database, located at the end of the drive (in case of MBR formatted drives) or inside the hidden 1 MB partition (in case of GPT drive), which is system-reserved. Windows uses this database to monitor drive state and recover corrupted databases or mistakes on the drive. Thus, Windows requires at least 1 MB of unallocated storage space to switch from basic disk to dynamic. Consider this if there is a need to convert a basic disk to dynamic. Dynamic disks use special management algorithms to create fault-tolerant volumes. You can also create volumes that span multiple physical drives (for example, one drive on a two HDDs), striped volume, mirrored volume, simple volume or RAID5 volume. Windows uses Logical Disk Management (LDM) and Virtual Disk Service (VDS) to perform these tasks. 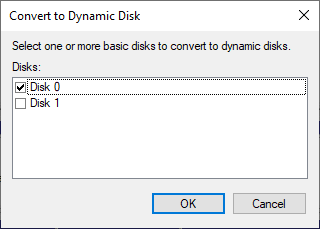 How to Convert a Basic Disk to Dynamic? Switching from basic disk to dynamic disk is a very simple process that takes up to five minutes or less. There is no need to download special tools or additional third-party storage. You can use the built-in default Windows disk utility. Tip. You can switch from basic to dynamic drive with no need to change the partition structure or wiping data, but you will need to delete all partitions (thus all data will be lost) if you want to switch back to basic. Remember to always back up the important data. Windows will show you the warning message. Press Yes and wait for the procedure to be done. Disk successfully switched from basic to dynamic. At first, back up your data. If you want to convert dynamic disk to basic, you need to basically format entire drive and delete every existing partition. This procedure deletes everything, so it’s better to be safe than sorry. It’s done, the disk conversion is finished, and it turned back to basic. Now you can map it and create partitions to store data.